With shirt (same shirt is used for both Programs) – $40 first Child, $30 Second and Subsequent Children. If no shirt is needed (child is using shirt from the previous season), subtract $5. With Shirt, $25 first child, $20 subsequent children. If no shirt is needed (child is using shirt from the previous season), subtract $5. With Shirt, $15 first child, $10 subsequent children. If no shirt is needed (child is using shirt from the previous season), subtract $5. 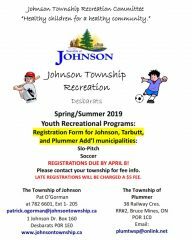 The Township of Johnson administers this program for Plummer children, who will be placed on Johnson (Desbarats) teams. There is an administrative premium of $5/per child – please add $5 to any of the above fees for each child. Registration forms for Plummer area children should be submitted to the Plummer Additional Township Office by April 8 and registration forms for Plummer children are also available at that Office. Call 705 785-3479.